Last year it might have been the moving between shortstop and third base. Last year it might have been that opposing pitchers discovered his weak spots at the plate. Whatever it was, Xander Bogaerts has spent a lot of time and effort in the offseason to correct it and it seems to be paying off. He is also the sole starting shortstop and will not be bouncing around between positions, which gives him the ability to concentrate on his position which has resulted in no errors in the first three games. Being only three games into the new season, it is a bit early to measure but he is not getting beat at the plate so far. He is sporting a .364 AVG, a .462 OBP and a .545 SLG with obvious signs of improvement over last year. He has 13 plate appearances with 4 hits, 4 RBI's, 2 walks against only 2 strikeouts. The RBI's shows that he is hitting the ball when it counts and putting it in play to score runs. Yesterday closing out the series with the Phillies, he went 3-4 with a walk, 3 RBI's and a run scored to help the Red Sox win 6-2. Bogaerts has been cautious as to his level of success so far, "Timing is something that I always have a problem with in the beginning, I kind of know myself on that. It just comes down to 'see the ball, hit the ball.' I'm just trying to simplify things as much as possible." Bogaert's feels like his stroke is starting to come back, "I just know when I'm me and I know when I'm not me. "Just going the other way is a good sign." 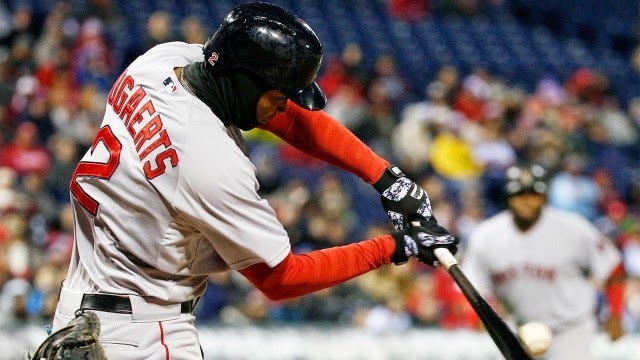 The Red Sox added depth to their offense this offseason and with Bogaerts hitting seventh or eighth for now, perhaps is also lessening the pressure on him. Can you imagine if this strong Red Sox lineup started to see Bogaerts emerging as a consistent offensive force? It could become downright dangerous to be an opposing pitcher.